GAO-10-593T: Published: Apr 22, 2010. Publicly Released: Apr 22, 2010. GAO investigators posed as fictitious consumers seeking services from debt settlement companies. 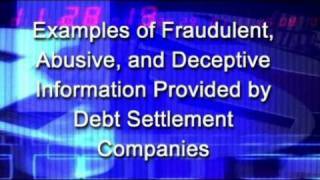 This video includes examples of fraudulent, abusive, and deceptive information company representatives provided to us. Audio interview by GAO staff with Greg Kutz, Managing Director, Forensic Audits & Special Investigation. As consumer debt has risen to historic levels, a growing number of for-profit debt settlement companies have emerged. These companies say they will negotiate with consumers' creditors to accept a lump sum settlement for 40 to 60 cents on the dollar for amounts owed on credit cards and other unsecured debt. However, there have been allegations that some debt settlement companies engage in fraudulent, abusive, or deceptive practices that leave consumers in worse financial condition. For example, it has been alleged that they commonly charge fees in advance of settling debts or without providing any services at all, a practice on which the Federal Trade Commission (FTC) recently announced a proposed ban due to its harm to consumers. The Committee asked for an investigation of these issues. As a result, GAO attempted to (1) determine through covert testing whether these allegations are accurate; and, if so, (2) determine whether they are widespread, citing specific closed cases. To achieve these objectives, GAO conducted covert testing by calling 20 companies while posing as fictitious consumers; made overt, unannounced site visits to several companies called; interviewed industry stakeholders; and reviewed information on federal and state legal actions. GAO did not use the services of the companies it called or attempt to verify the facts regarding all of the allegations it found. GAO's investigation found that some debt settlement companies engage in fraudulent, deceptive, and abusive practices that pose a risk to consumers. Seventeen of the 20 companies GAO called while posing as fictitious consumers say they collect fees before settling consumer debts--a practice FTC has labeled as harmful and proposed banning--while only 1 company said it collects most fees after it successfully settles consumer debt. (GAO was unable to obtain fee information from 2 companies.) In several cases, companies stated that monthly payments would go entirely to fees for up to 4 months before any money would be reserved to settle consumer debt. Nearly all of the companies advised GAO's fictitious consumers to stop paying their creditors, including accounts that were still current. GAO also found that some debt settlement companies provided fraudulent, deceptive, or questionable information to its fictitious consumers, such as claiming unusually high success rates for their programs--as high as 100 percent. FTC and state investigations have typically found that less than 10 percent of consumers successfully complete these programs. Other companies made claims linking their services to government programs and offering to pay $100 to consumers if they could not get them out of debt in 24 hours. GAO found the experiences of its fictitious consumers to be consistent with widespread complaints and charges made by federal and state investigators on behalf of real consumers against debt settlement companies engaged in fraudulent, abusive, or deceptive practices. Allegations identified by GAO involve hundreds of thousands of consumers across the country. Federal and state agencies have taken a growing number of legal actions against these companies in recent years. From these legal actions, GAO identified consumers who experienced tremendous financial damage from entering into a debt settlement program. For example, a North Carolina woman and her husband fell deeper into debt, filed for bankruptcy in an attempt to save their home from foreclosure, and took second jobs as janitors after paying $11,000 to two Florida companies for debt settlement services they never delivered. Another couple, from New York, was counted as a success story by an Arizona company even though the fees it charged plus the settled balance actually totaled more than 140 percent of what they originally owed.